Ten years ago this month an epic upset occurred at the Academy Awards when Harrison Ford opened the envelope for Best Picture and rather than crowning "Saving Private Ryan", as everyone expected, uttered the words "Shakespeare In Love". I vividly recall this announcement because when it happened I exchanged ecstatic high-fives with my friend Rory. I believed then, and believe to this day, that John Madden's "Shakespeare In Love" was the best film of 1998 and also one of the best films of the 90's. There are those who have dismissed its victory as merely being the result of a shrewd marketing campaign and there are those who believed, as I have heard most often, "Saving Private Ryan" deserved the statue because it was more "important." 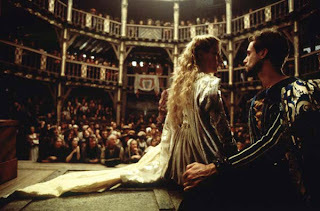 But as I rewatched "Shakespeare In Love" this month something struck me. Midway through Viola de Lesseps (Gwyneth Paltrow) stands before Queen Elizabeth (Judi Dench) who is bestowing favor upon the upcoming marriage Lady de Lesseps does not neccesarily desire to the dastardly Lord Wessex (Colin Firth). The Queen has seen Viola many times before at plays and Viola says she loves "poetry above all." The Queen counters: "Playwrights teach us nothing about love. They make it pretty, they make it comical, or they make it lust. They cannot make it true." Viola gasps: "Oh, but they can!" Of course, Viola's future husband disagrees and tells her Majesty he will "wager his fortune" that a play cannot show the "very nature of truth and love". The wager is taken by William Shakespeare (Joseph Fiennes) himself, disguised at the present moment, and the Queen agrees to bear witness to the wager when and as she sees fit. Finally, Will's muse arrives in the form of Viola, though she arrives in another form too - that is, Thomas Kent, because Viola, so taken with the theater ("I would stay asleep my whole life if I could dream myself into a company of players"), that she risks the ridicule of all by dressing as a man and playing the part of Romeo in the play at the Rose that now begins to take shape on Will's page. The esteemed Roger Ebert writes: "It was conventional not to notice the gender disguises, and 'Shakespeare in Love' asks us to grant the same leeway", which we do. Soon, though, Will discovers the identity of Thomas Kent and soon he finds a blade from a knife at his neck courtesy of Lord Wessex who spies the young writer coveting his "property" - that is, Viola - but even the threat of death will not deter Will from scaling Viola's balcony to declare his love in a scene that seems, oh, vaguely reminiscent of another balcony scene that we all know by heart. A breathless montage in the middle moves with grace from real life to the stage and back again as we see how one influences and helps to create the other. It is wonderful to witness how the film itself (in the Oscar winning screenplay by Marc Norman and the famed Tom Stoppard) seems to be taking the shape of a Shakespeare play as it progresses, comedy becoming tragedy and a couple obligatory swordfights and chance playing as crucial a role as fate - a windswept play bill finding its way to Viola just in the nick time and a character masquerading as another character to fool a different character. The prose is filled with dozens of moments that are meant as modern send-up, such as a boat-rower pitching Will a script and lines like one character saying "The show must...." and the other replying "Go on!" (perhaps there is a bit too much of this) but so much more of it is preposterously romantic and real, deft comedy. Listen as a scene opens with a waiter at a tavern reciting the daily special: "...a pig's foot marinated in juniper-berry vinegar served with a buckwheat pancake." The supporting characters are not only plentiful but rich and satisfying. Not just Rush and Dench (who earned the Oscar for Supporting Actress) but Ben Affleck as the Russell Crowe of his day, Ned Alleyn, who may be pompous and arrogant but still true enough to his art to admit a play is good even if he thinks his role is far too small. Wilkinson, meanwhile, is brilliant as Fennyman, first no-nonsense and driven by money but slowly transformed by the power of the theater as he watches the rehearsals day after day and winds up with a "small but vital role". The moment when he ascends the stage and admonishes a few onlookers for talking over the players is at once hilarious and moving. I, of course, had no say but my Best Supporting Actor of that year would have been Wilkinson (the way he says "My heavens" at a critical moment may slay me more than anyone else in the world). Paltrow also won an Academy Award for Best Actress and together she and Fiennes (who did a remarkable job of grounding such a towering historical figure) have a touching chemistry. The moment in which they share nothing more than a look when she is onstage and he is backstage is one that will make you smile just like the characters themselves are smiling. The movie nimbly builds to the play's first public performance as Viola ignores her slated departure time on a voyage with Lord Wessex to the foreign shores of some dreaded land called "Virginia" and lights out for the theater where as chance (there's that word again!) would have it the young man scheduled to portray Juliet loses his womanly voice and as panic reigns supreme and all hope seems lost we watch with the sort of rush we all hope to feel every time we sit down to a movie as Henslowe sends Viola, without the aid of any disguises, onstage to a remarkable gasp. But no one objects. The play holds sway. It continues. And seeing "Romeo and Juliet" acted out just as it would have in 1593, the audience hanging on every word and every thrust of a dagger, is mesmerizing especially in how the script has given a second meaning to nearly every line exchanged between Will and Viola in their portrayal of the title characters and as the curtain falls - so to speak - and the audience rises in thunderous applause we realize that playwrites can teach us everything about love. They make it pretty, they make it comical, they make it lust, and they make it true. I too remember being quite happy. I haven't seen the film in sometime but my disdain for Saving Private Ryan has only grown over the years. One gruesomely realistic scene does not make a movie worthy. I think anyone who knows me will not blink an eye at the best movie of 1998 in my opinion: Thin Red Line. Shakespeare in Love was certainly charming (though I balk at story lines that reduce a grand artist to nothing more than his/her own life experiences).